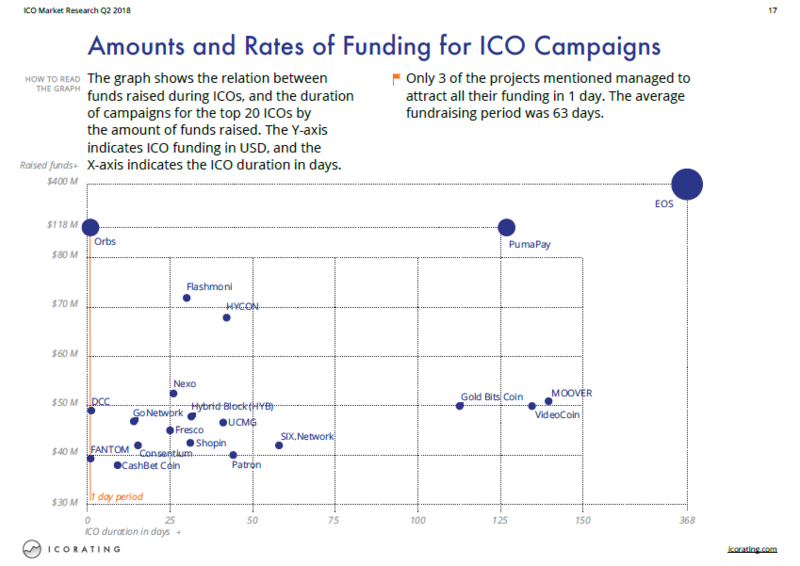 Some positive news for the crypto world, in the form of fundraising figures. The financialization of crypto assets, melding securitization with tokenization, continues to move forward. Based on our latest data, this year saw over 140 crypto investment funds enter the space. While that is below the 270 from last year, a couple of developments are notable. First, we continue to see new entities formed month over month, even though the narrative is that most crypto funds are 50%+ down this year. Second, there has been a healthy development of ecosystem funds, attached either to exchanges or at the protocol level. These entities are well aligned with funding projects that are adopted by consumers, which then would use the exchange or protocol to engage with the token. Circular logic, or lifting yourself up by the bootstraps -- you decide! We also know that much of the focus in crypto fundraising has now shifted to STOs, with both enterprise blockchain success stories like BNP Paribas building out syndicates of financiers to provide large loans (e.g., Red Electrica), as well as public STO asset examples like the Aspen resort token from Templum. Similarly, many of the crypto funds are doing equity investing first, and getting tokens for free. With that in mind, we are encouraged by the October numbers in our ICO/token database. ICO funding data listed on public trackers, and cleaned/confirmed by us to the extent possible, shows about $600 million in flows, which is higher than $450 a month ago. There were not any major unusual chunky raises like the Petro or RubyX. But there was a roughly equivalent amount ($600 million) of traditional venture capital activity in the space. Looking at the chart below, it is becoming a trend that VC funding constitutes 50% of the overall money flowing into the space. From an economics perspective, it is good to see institutional investors find the risks attractive again. From a decentralization perspective, it seems less likely that global crowdfunding will democratize the ownership of a future Internet. Everyone knows: Fidelity has made its move into crypto custody. The firm has been toying with an offering into the space since starting to mine Bitcoin since 2015. The product itself is exactly what institutional investors, i.e., fund manufacturers, have been complaining about over the last year: (1) a custody platform, akin to Coinbase / Xapo / Bitgo / Kingdom Trust, and (2) an order routing system that creates best execution across exchanges, independent versions of which also exist (e.g., XTRD). But to package it and make it accessible for the traditional financial services industry is a massive leap for the asset class. Here's what many people don't know. Fidelity is one of the top 4 investment advisor custodians in the United States -- including BNY Mellon Pershing, Schwab, and TD Ameritrade. Together, these firms control about $2 trillion in advisor assets, with another $1 trillion in independent RIA assets sitting on smaller players or self-clearing firms like LPL. These custodians know (1) how to service a long tail of small independent money managers, (2) throw annual conferences attended by thousands of people to look at investment products, (3) enable hundreds of wealth tech companies to sit on top of their core services, and (4) deliver performance reporting and other tools helping regular people access their assets. That is not something any of the crypto players come close to doing or understanding. To moderate our excitement, we highlight that serving a manufacturer (i.e, a crypto fund) is not the same as serving a distributor (i.e., a financial advisor). Still, we believe the software is transferable to some extent, and the entire world of digital wealth management awaits open APIs here. Second, we think best execution will be a real boon to the space, unbundling what an exchange should do from what a broker should do. If regulators like the NY Attorney General continue to find bundling and conflicts of interest offensive, some US firms will have to be broken up into component parts and spun off. Not Fidelity -- which will benefit from being impartial. And further, with enough volume and a good routing system, perhaps arbitrage bots and crypto market manipulation may start to fade out of the ecosystem. Fidelity's entry -- though long time in the making -- is a clear win for crypto. We chaired a unique event in Dallas this week, and a few key takeaways are worth mentioning. First, something that really stuck out was the audience itself. We informally surveyed about 150 attendees, of whom 50% were financial advisors allocating assets for retail and HNW investors. Further, 70% of the audience owned Bitcoin, 50% owned ETH, and about 15% participated in an ICO directly. Two people, not including Lex, had the unfortunate pleasure of buying Crypto Kitties. The largest financial advisor in the United States, Ric Edelman, who runs $200 billion across 85,000 clients, stayed with us for the full agenda. Just a year ago, the overlap between the wealth management and crypto communities would be a null set. On the fund manager side, we had Tuur Demeester from Adamant, Sean Keegan of Digital Asset Strategies, Kyle Samani of Multicoin, Mat Hougan of Bitwise, and Bart Stephens of Blockchain Capital. We were impressed by the very variety of investment strategies on display. For example, Tuur primarily runs a Bitcoin investment strategy, using leverage on/off BTC to amplify alpha. Similarly, the custodian Xapo only custodies BTC, backed by a reserve of coins -- $10 million worth bought in 2014. Others run index funds -- with Bitwise creating passive indexes and Digital Asset Strategies trying to deliver smart beta on the same baskets. And of course, Multicoin and Blockchain Capital both take fundamental venture-style bets on direct projects. We were reminded again of the BCAP token offering, a security token that Blockchain Capital launched as a unit in its fund. We can't do justice to all the conversations (i.e., custody, regulation, markets), but another one that stuck out for us was an asset allocator panel. Paul Pagnato of PagnatoKarp, a wealth advisor to large family offices, sees crypto living inside the venture capital allocation slice. James McDonald of Vishnu Wealth Management talked about building a 10-15 coin basket with the largest liquidity, while protecting for downside exposure. And we'll end on the perspective of Tyrone Ross Jr., who never wanted to put his clients into crypto assets. Instead, his clients just started disclosing to him their over-exposure to digital holdings -- so he had to design hedges and diversification strategies that would balance out the idiosyncratic risk. He also had to start reading white papers and websites to figure out what his clients were talking about. Advisors with such an appetite will retain their clients relationships, while those like Noriel Roubini will be drowned out by the winds of time. Source: Tyrone's Video, DASS Twitter, Lou Kerner on Nouriel Roubini. 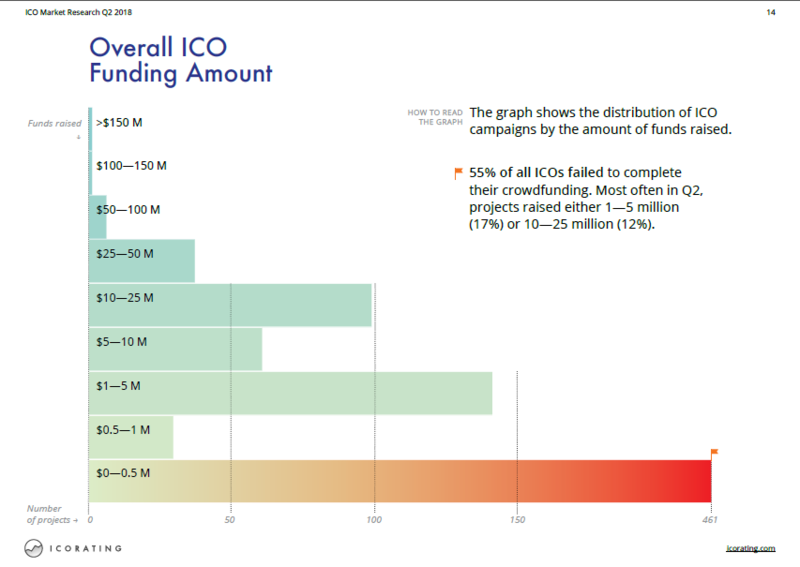 CRYPTO: September ICOs 90% Down from January, but Venture Funding is Ray of Hope. We're really trying to make this look good! But it's not working. 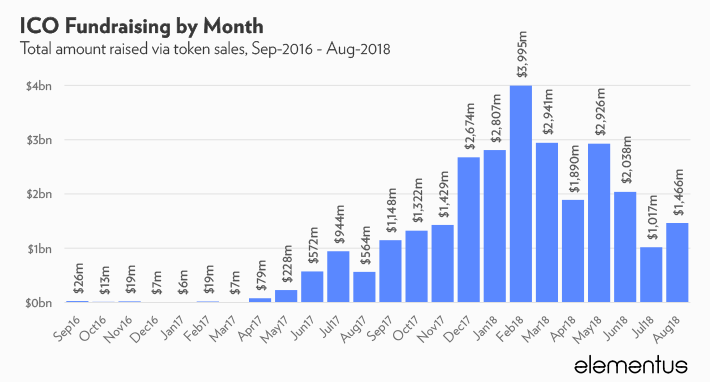 We've scrubbed token offering data from September, and the trend continues generally to be down. 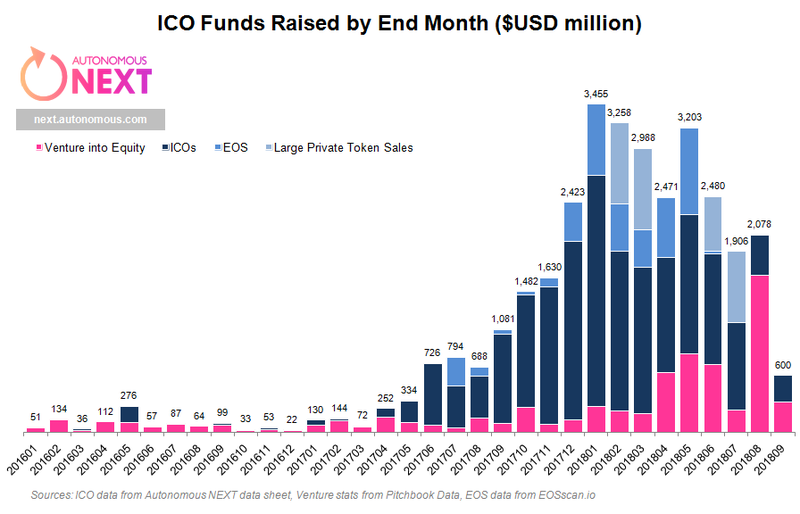 Last month saw about $300 million in ICO funds raised, with the month before that revised to a bit over $400 million, a far cry from the $2.4 billion in January of this year. If we include EOS and other chunky private token raises, the highs go to over $3 billion, suggesting that monthly ICO activity is down 90%, which of course looks a lot like Ether's price performance, but with a 3-month lag. There are three narratives at play, which are worth exploring. First, perhaps investors have devalued the idea of buying a utility token (does nothing yet, legally non-binding), and instead want to buy equity in the same companies. 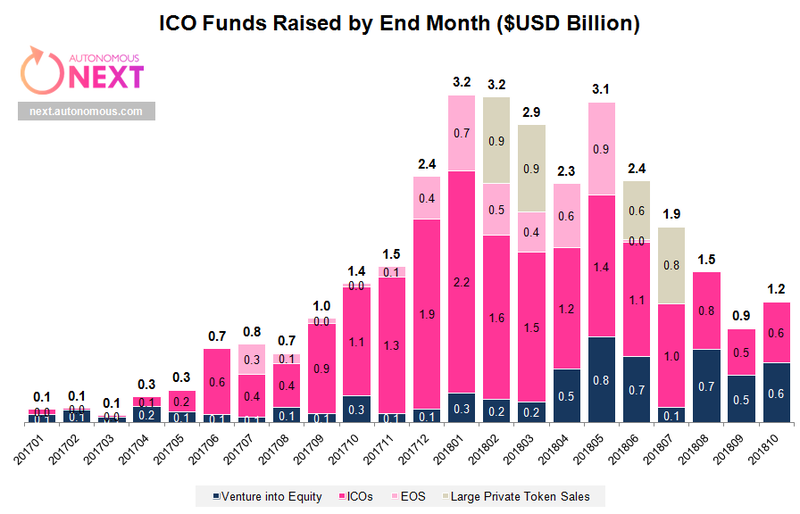 To test this, we looked at Pitchbook's data on blockchain and Bitcoin venture capital raises, which you can see in the second chart below in the magenta color. There is indeed a lagged effect in venture as well, with increasing drips of capital, reaching over $1 billion in August 2018. Why is that? Two reasons: (1) fintech companies like Robinhood and Revolut pivoting into crypto and (2) Bitmain trying to vacuum up capital before the public offering. This gives us a slightly more balanced view of funding in the space -- with recent months seeing a decline in public crowdfunding, but an increase in private checks. Anecdotally, projects are selling equity and giving matching tokens for "free" to investors in the capital structure. The second narrative is Security Token Offerings (STOs). We know many different platforms working on this space -- from Templum, to Tokeny, to Sharespost, to Indiegogo, to tZero. And while we'd love to plot STOs on this chart as well to offset the decline, truth is that STOs won't hit the market in earnest for another half-year at least due to regulatory indigestion. We tried to find that extra monthly billion in STO land, but it's not there yet. And last, we're testing a narrative about the collapse/crisis in Chinese P2P lending since 2015, and whether that risk-seeking capital wound up in ICOs. If you've got any hints on that last one about Asia, let us know!